Lululemon Athletic helped investors to find a bit of Zen Monday when the maker of yoga wear raised its forecast for sales and profit for its fourth quarter after enjoying a blockbuster period during the holiday season. The company has fought to keep its market shares from numerous competitors such as Athleta by Gap to Kohl’s that are entering the craze of athleisure, which spooked some investors in December when it reported a quarterly profit that was lower than had been expected as its bloated inventories and expenses from international expansion pressured margins. Add in some notes that were not positive about Black Friday and a warning of high levels of clearance items, during the second largest shopping weekend all year saying the clearance racks were doubled their size of last year, along with deeper markdowns, and you make for low expectations. There generally has been a great deal of gloom surrounding retail after others such as Macy’s and Gap Inc reported holiday results that were poor. Therefore, it was not that surprising to see shares of Lululemon rise by 6% when the company announced that it now is expecting its revenue to be between $690 million and $695 million, for the fourth quarter when an earlier forecast has set it for between $670 million and $685 million. Lulu has also changed its guidance for profit with it now projected to be between 78 cents and 80 cents a share for the fourth quarter, which is up from its earlier forecasted range of between 75 cents and 78 cents. The yoga wear maker has worked on retooling its image after some of its yoga pants had been recalled during 2013 due to being too sheer. 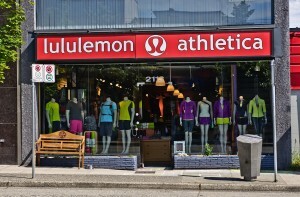 Lululemon revamped products to include more with patterns and has worked to increase its business for men and children.